DÜSSELDORF. At Viscom Europe 2007 in Düsseldorf, G+B pronova GmbH (Bergisch Gladbach) will be presenting the current generation of intelligent HoloPro™ media displays. The special features of the original HoloPro™ displays have been thrilling architects, designers and marketing experts all over the world since they were launched. The central point of the fair presentation is the new HoloPresenterplus with its integrated i-PrOS® touch control. The HoloPro™ film and i-PrOS® touch foil are embedded securely in composite glass to protect them from outside influences. Thanks to the improved embedding of the interface controller, unsightly wires and cables have now disappeared inside the housing. 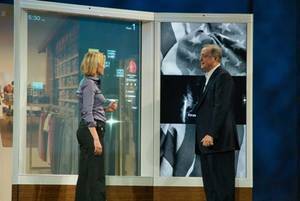 Martin Kischkoweit-Lopin, the Certified Engineer who is the CEO of G+B pronova GmbH: "The embedding of the HoloPro™ projection films together with our i-PrOS touch film in one screen means that we can offer our customers a presentation system that is both elegant and functional. There are no more stuck-on foils or jutting out controllers to disturb the picture, and at the same time the electronic components are protected from any manipulation." 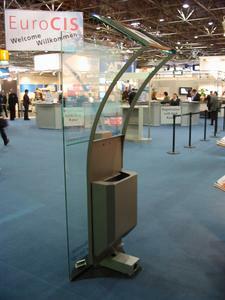 The various HoloPresenter models are ideally suited for use at events or eye-catching displays for welcoming visitors. The HoloPresenter combines all the essential components in a slim column that can be used at the POI or POS as required. New covering secures the high-contrast projectors from manipulation. The new Digital Engine MiniPCs, which can be installed at the foot of the stand (also theft-proof), make the HoloPresenter a complete Digital Signage package. G+B pronova GmbH and visualFOOD GmbH will be presenting the new hardware and software bundle HoloPresenter Hello! at Viscom. 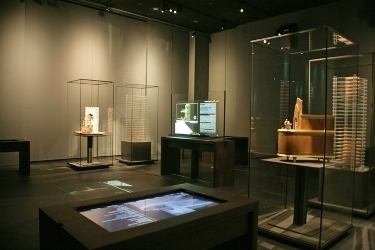 Living projections on highly transparent screens welcome visitors and provide interactive guides. The screenFOOD® Hello! bundle combines the most important screenFOOD® SA modules for the time-controlled display of the most varied kinds of media in one package. 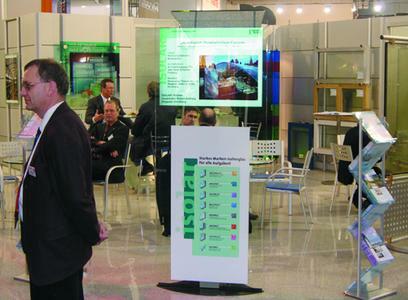 screenFOOD® SA can be used to combine event schedules, welcoming texts and multimedia easily. This package is low budget and easy to use. Events (incl. starting and finishing times) are entered using a standard Excel table. The layout and page breaks are automatic. You can use the GRAPHIC DESIGNER to generate as many design templates as you wish and more advanced users can also incorporate dynamic picture elements such as arrows or pictograms. The on/off times of the beamer are also controlled via the screenFOOD® software. Die G+B pronova GmbH ist der erste und führende Anbieter von holographischen Projektionsflächen.